When building a new computer, step 1, Get a Case! 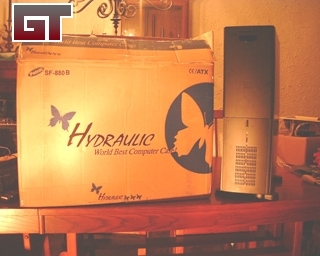 This case came from CaseDepot, they provide a wide selection of cases from Mini-Towers to Rack mounts. 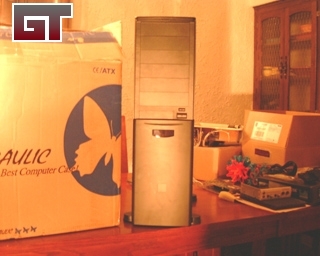 The product we will be looking at is Model CFL-AXM-5260B (B was for Black, this case also comes in white). 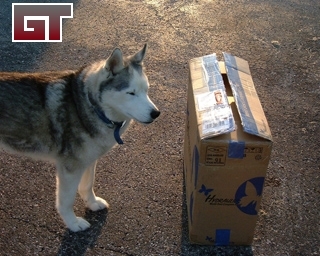 Here we see the box it was shipped in, Kavik (Head of the receiving department) notices something is wrong. They sent it under the wrong name! Somehow the person taking my order got the name wrong, oh well I can live with the little mistakes! Size and Weight 7.5"x17.3"x25.6" (WxDxH) 35 lbs. Drive Bays 1 External 3.5" 6 External 5.25" 3 Internal 3.5"
The basic cost ($105 USD) is with the 250W PSU, for $25 more you can get a 300W. I opted to pay $50 more for a 400W PSU! 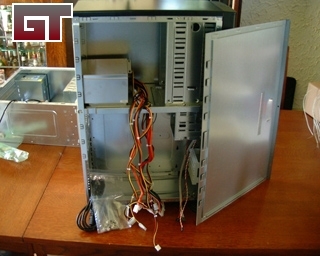 The main feature of this case is the hydraulic sliding door, but a nice feature is the addition of a slide out motherboard tray. Popping the sides and finding what was included was a bit disappointing. 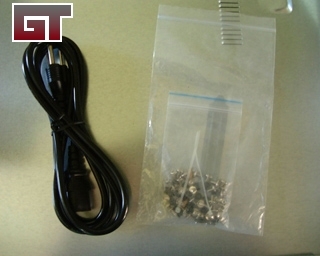 Yes I got a power cord but they were a bit skimpy on spare parts and no documentation.